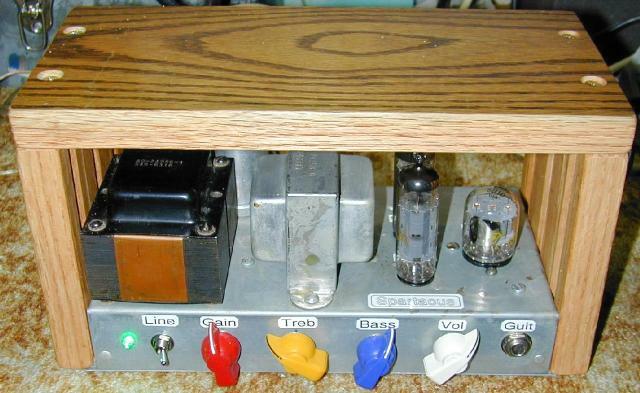 The Spartacus amplifier project involves converting a Hammond AO-44 organ reverb amp chassis into a low-noise push-pull guitar amplifier that uses only three tubes. Output power is around 12 Watts. That may not seem like much, but the amp can get quite loud. A cool-looking 6U10 compactron triple triode is added to the amp's chassis, it provides the first two gain stages and the phase inverter stage. The Spartacus amp is small, light weight and relatively power-efficient for a tube amp. The Spartacus amp can be compared to the Hammond AO-44 Reverb Amp to Hi-Fi Amp Conversion project. The goal is slightly different: the Spartacus amp has more gain and higher output power, making it better for use as a guitar amplifier. 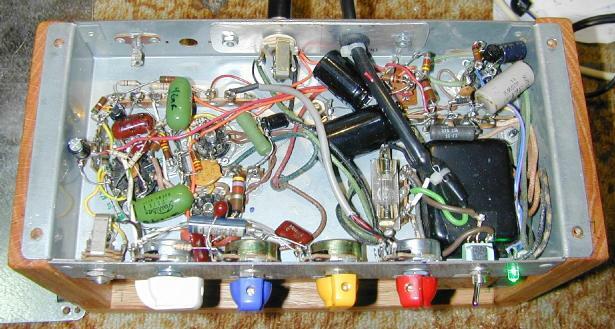 Unlike the Hi-Fi amp project, the Spartacus amp involves a complete rewire of the Hammond AO-44 chassis. The rare and expensive 6GW8/ECL86 tubes in the AO-44 have been replaced with common (and higher power) 6BQ5/EL84 tubes. The name "Spartacus" was inspired by the slave who broke free from the ancient Romans and wreaked havoc on the empire for many years. The amp makes an excellent stereo guitar slave amp when used in conjuction with pitch-shifting vibrato amps such as the Hammonator 2RVT and the Lil' Tiger. Like its namesake, the Spartacus amp can break free and function as a stand-alone amp, it is a good match for both 10" and 12" guitar speakers. The Hammond AO-44 amplifier chassis can be found on eBay for reasonable prices. The Spartacus design is simple and clean. The wiring is a bit dense, but the amp is not overly difficult to assemble. The controls include the basic volume, bass and treble adjustments as well as a gain control. The gain control (adjustable negative feedback) is much more than a second volume control. It adjusts the the character of amplifier's sound from a compressed and tight jazz sound to a punchy and loud sound that is similar to the popular Fender 5E3 Tweed Deluxe amp. In other amps, adjustable gain controls are sometimes labeled "presence" or "loudness". This is a fairly high-level project. It takes advanced technician skills to deconstruct and reconstruct the ampifier circuitry. Also, there are plenty of lethal high voltages inside of this amp including 120 VAC and 315 VDC. The project should only be taken on by someone who has experience working with high voltage circuitry. The power cord should always be removed when working on the amp, the circuitry is designed to discharge the capacitors when power is removed, but it's always a good idea to short out the electrolytic capacitors before working on the amp. The guitar input jack feeds directly into preamp VT1b, the single high gain triode section in the 6U10. The preamp output drives a Baxandall tone stack, which feeds the volume control pot. The output of the volume control drives VT1a, a low gain triode section in the 6U10. VT1a acts as a gain stage and summing point for the Gain control's negative feedback signal. The 100pF capacitor on the grid of VT1a and the 47K/220pF network on the plate of VT1a reduce the gain of the amp above the hearing range to eliminate unwanted radio frequency sensitivity. The output of VT1b feeds VT1c, a low gain triode section in the 6U10. VT1c is wired as a floating cathode phase inverter. The two out of phase signals from the phase inverter drive VT2 and VT3, the 6BQ5 pentodes, which are wired in a push-pull configuration and drive the output transformer. The 6BQ5 pentodes are configured with a fixed-bias cathode arrangement. The configuration of the power amplifier (VT1a, VT1c, VT2 and VT3) is similar to the Hammond AO-43 amp design. Some of the cathode bias and plate resistors were changed to accomodate the different gain characteristics of the 6U10 triodes compared to the AO-43's 12AX7 triodes. In the power supply section, the transformer high voltage winding is sent to a center-tapped full wave rectifier consisting of two 1N4007 diodes with protective 1nF capacitors. The high voltage DC is dropped through a totem-pole array of resistors and capacitors to produce the voltages used in the amp. The 82 ohm resistor simulates a rectifier tube's internal resistance and removes a bit of sharpeness from the amp's sound. 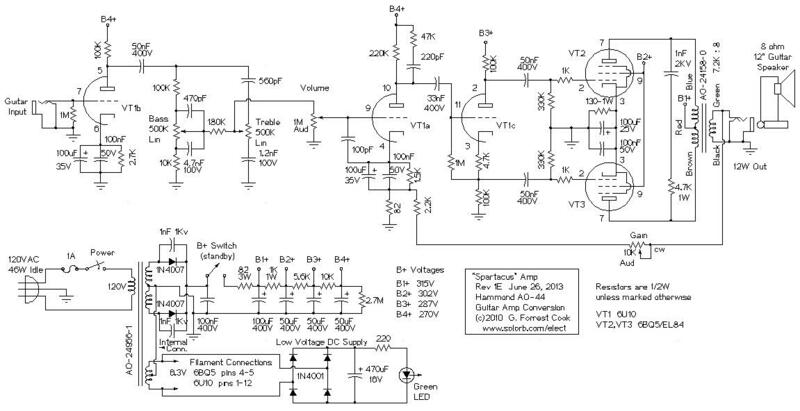 My Vacuum Tube B+ Delay circuit can be used in place of the optional standby switch for automatic power-on sequencing. The circuit can help to improve the lifetime of the tubes. The 6.3VAC filament supply is rectified by four 1N4001 diodes and filtered by a 470uF capacitor to produce around 7.5VDC. The DC voltage drives an emerald green (505nm) LED via a 220 ohm current limiting resistor. A standard incandescent pilot light could also be used here if you can find enough space to mount it on the front panel. With the exception of the filament wiring and the ground wire, almost all of the original AO-44 wiring should be removed. The bakelite terminal plate on the back of the amp should be drilled out and replaced with an aluminum plate. Drill holes in the plate for the speaker output jack and AC power wire. The AC power wire goes through a protective rubber grommet and is secured to the chassis with a panduit tie. Holes were drilled in the chassis for the 6U10 compactron socket (12 pin), the four potentiometers, the input jack the power switch and the LED. The 120VAC wiring requires the addition of a chassis-mounted fuse holder, a terminal strip and a power switch. The 1N4007 diodes can be wired to the back of the 6X4 rectifier tube socket or placed on their own terminal strip. Two conductor coaxial wire was used for the gain control pot's wiring. Only one end of the coax shield should be grounded to eliminate ground loop hum. The AO-44 amp has a bare ground wire that links the ground pins on the tube sockets and terminal strips together with the capacitor and transformer center tap from the power supply. This ground should be extended to any additional terminal strips and the guitar/speaker jacks. The majority of the amplifier wiring was done in a point-to-point fashion between the tube sockets and the nearby terminal strips. One of the original terminal strips was left in place and the original parts were unsoldered. A second original terminal strip was removed to make room for the 6U10 socket, a smaller terminal strip was installed in one of the vacated screw holes. The tone stack resistors and capacitors were mounted directly to the back of the tone control potentiometers. A wood case was constructed by sawing three pieces of recycled oak flooring to size using a table saw. A piece of galvanized sheet metal was cut to size for the bottom plate. Stick-on rubber feet were applied to the corners of the bottom sheet to prevent scratching. Plug the amp into a guitar speaker. Plug an electric guitar into the input. Turn the standby switch off and the power switch on. Wait for the tubes to warm up, then turn the standby switch on. Tweak the knobs for a good sound. Play the guitar. Enjoy the "spartacular" tube sound! The Fuzznikator push-pull tube distortion circuit makes a nice companion for this amp. The original 6X4 rectifier tube can be used in this amp, although it is not recommended. Just eliminate the 82 ohm 3W resistor and the 100nF 400V capacitor, then connect the 6X4's cathode + line to B1+. The solid state diodes are more efficient since they don't waste power on a large rectifier filament, they also increase the output power. The power transformer will run cooler and last longer with solid state diodes. Also, unlike the hot-running 6X4 tube, the 1N4007 diodes should never need replacing. There is nothing special about the 6U10 triple triode besides its look and its "compactness". It is possible to replace VT1b with half of a 12AX7 dual triode or a 7 pin 6AV6, VT1a and VT1c can be replaced with a 12AU7 dual triode. Keep in mind that 6AV6 tubes tend to be microphonic and a quiet one may need to be hand-selected from a few samples. The existing 6X4 socket should not be re-used for the 12AX7 or 12AU7, it is too close to the power transformer and will pick up hum. Drill new 6AV6 and 12AU7 socket holes in the area where the 6U10 is located. The spare RCA jack on the back of the AO-44 chassis can be used as a line-level output from the Spartacus preamp stages. This can be handy for feeding the signal to a mixing board. Connect a 10nF 400V capacitor from pin 10 of the 6U10 (VT1a plate) to the center lead of the RCA jack. If you like the Spartacus amp, you may want to take a look at my Howler Monkey amp, it uses 6AQ5 output tubes and off-the-shelf transformers. The Howler Monkey features a balanced differential phase inverter.